Make routine moisture determination easy with the HC103 halogen moisture analyzer. With touchscreen operation and user guidance, the HC103 is convenient to use. The robust design ensures reliable results for years to come, whatever types of samples you have. Watch the video and learn more about routine moisture determination. 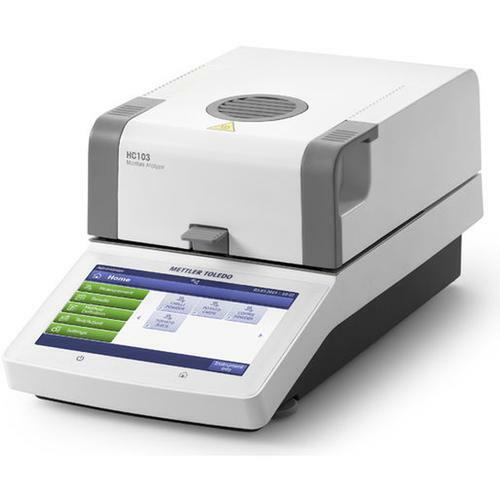 The advanced moisture analyzer HC103 is the perfect choice for quality control and in-process control applications. With touchscreen operation and user guidance, the HC103 is convenient and easy to use. The graphical user interface makes you feel at home right away. Start a measurement immediately with one click. Easy setup - The wizard guides you step by step through the processes. The instrument tutorial is ready to support you with any question, directly on the instrument. Simple configuration - Often several instruments are used in parallel. You only need to configure one unit (for example language, print settings, method, shortcuts etc.) and then you simply transfer these settings to the other units using a USB flash drive. Advanced moisture analyzer should be routinely tested in between service intervals to give conficence that moisture measurements are consistently correct. With SmartCal we offer a unique test substance that verifies the overall performance of your moisture analyzer in a simple 10 minute test. Looking for a replacement of your HB43-S or HB43?